Now, in the early days of CrossFit, people were making a pilgrimage to that small gym on Research Park Drive to learn from Coach Glassman. However, many people also came because they wanted to share their developed expertise in functional movement with coach. Let me tell you, my friends, that over the seven or eight years that the original CrossFit gym was opened on Research Park Drive, we saw some rather bizarre definitions of functional movement. People came into the gym claiming to be teaching functional movement. Yet what they were teaching was not consistent with the methodology that coach was teaching. And very soon we realized, well, if we claimed to be doing functional movement, we need to define our terms. This was the brilliance of Coach Glassman. To really define, to articulate very specifically, exactly what he meant when he said, “We do functional movement at high intensity.” He defined to the ninth degree every quality of functional movement. And so that when we claim to be doing functional movement, we were speaking a language that we all agreed upon and understood. It just doesn’t make sense. Everyone in this day and age, claims to be doing functional movement. My recollection in 2001 when I first found coach is that I thought I was doing functional movement. I mean, after all, that’s what the Academy Instructors at South Bay Regional convinced me I was doing when I was running long, slow distance. Monday, Wednesday, Friday. And was partaking in body-building movements, such as bicep curls, deltoid raise and calf raise on Tuesday and Thursday. They claimed that was functional movement. Then I met coach, I realized, “Whoa, I’ve got this all wrong.” There’s a unique definition and prescription in which I have to abide by if I want to achieve this elite level of fitness that I was witness to in that gym with Coach Glassman. Therefore, my friends, if you and I are using terms, such as “warrior spirit”, we have to ensure that we’re consistent and understanding and agreeing upon the specific qualities that define a modern-day warrior. 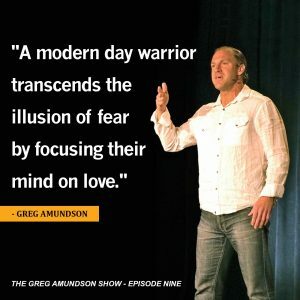 Because after all, if we go into a gym or we go into a martial arts dojo and we ask the athletes and the martial artists, “Do you have the warrior spirit?” Everyone’s going to say, “Yes!” We all love to make the claim, “I’m a warrior!” However, we really need to identify specifically what is a warrior? What are those qualities of a warrior that we long to display in our life? Oftentimes, we associate the warrior with what the warrior does. For example, for the longest time, I was associating my warrior spirit strictly with the profession of arms. The fact that I was a law enforcement officer and military officer was enough. Obviously, I’m a warrior. Well, thank goodness for my dad who inspired me to realize that a true warrior is defined more by what is taking place between their ears, not in their external reality. And this brilliant insight from my dad is exactly the same insight that Coach Glassman provided me in regards to CrossFit. When Glassman said, “You know what, kid? The greatest adaptation to CrossFit takes place between the ears.” When we look to the Bible, we see this time and time again. Christ is teaching us that granted, our actions are also important. However, the formation of every action we partake in our life begins within the temple of our mind. So when we begin to identify the qualities of the warrior spirit, one of the first places we go, my friends, is between the ears. We go to the heart of the matter. We go into the mind of the warrior. To understand and identify what makes this man or woman different from every other class of society? What can we learn from this man or woman? In what manner is this man or woman thinking? That is where everything begins and ends, my friends, in the temple of our mind. As we begin our episode today. I would like to read to you from my book God In Me: Daily Devotionals for a Heart Like Christ. This particular devotion is from June 12th. Let’s begin. To develop a heart like Christ, you must first discipline yourself to think like Christ by conditioning yourself to see the good in all the conditions of your life. You gradually move the direction of your life towards the good. Similarly, as you begin to life the quality of your thoughts towards the good, you will begin to attract conditions, experiences, opportunities, people, attainments and powers, which further express your ability to see what is good. Regardless of the conditions of your life, goodness is always present because God’s presence is always with you. Instead of relying on external conditions to determine your emotional state, turn your attention inward and feel God’s eternal love. God is always the same and his love for you is always available. My friends, the reason that I chose this particular devotion to read to you today in our study of identifying the qualities of a warrior spirit is that this is the beginning. This is the inception point. This is the insertion point in our development of the warrior spirit. I open by writing “to develop a heart like Christ, you must first discipline yourself to think like Christ.” We could substitute the word Christ for warrior or better yet, Christ is a warrior. So to develop a heart like a warrior and like Christ, you must first discipline yourself to think like Christ and therefore to think like a warrior. You essentially have to condition your mind to think good thoughts in spite of the conditions or the circumstances you may find yourself in. And that is the tipping point, my friends. That is the tipping point for the warrior. Oftentimes, unless we are very disciplined in our thinking, we rely on our external conditions and circumstances to dictate the quality of our thought. Where the warrior, independent of the circumstances or conditions in their life maintains a positive mental attitude. That is the warrior spirit. To further elaborate on that, my friends, let’s look to some of the cherished stories from the warrior tradition that further elaborate on the power of this warrior mindset. Many, many years ago one of the greatest warriors of all time, King Leonidas, the king of the Spartans was leading 300 Spartan warriors. Handpicked for their courage, their fighting prowess. Handpicked indeed their warrior spirit. He was leading these 300 into battle. Every single warrior that followed the great king knew that this would likely be their final stand. For they were preparing to fight an enemy force of overwhelming odds. Despite the fact that so many arrows would be in the air. That the arrows, as they rained down on him and his men would block out the sun. Despite that fact, he spoke words of positive expectancy. He spoke the words of a warrior and said, “Good. We will fight in the shade.” And his men shouted triumphantly. They believed in their king. They believed in themselves and their ability to succeed, independent of the circumstances they found themselves in. So, my friends, we see that one of the key characteristics of the warrior is mastery of the tongue. Mastering the spoken word. What is it about the spoken word that is so critical for the modern-day warrior? Well, as we’ve discussed and investigated, and even solidified in previous episodes is that our thinking precedes our speaking. You see, if King Leonidas in that critical moment was able to speak words of positive expectancy by saying, “Good. Then we will fight in the shade.” we have insight into the mind of the great King Leonidas. His mindset. His internal self-talk. The dialogue that took place between his ears must have been in alignment with the words that he spoke. Because thinking precedes speaking. For our next story, we turn to another great king. I think it’s important in the study of the warrior spirit to not only study great warriors but to study great warrior kings. I want to know about those people that were leading other warriors. I want to know about their quality of mind. Quality of body. Quality of spoken word. Because not only were they warriors, they were leading warriors. For that leadership, we turn to King Henry V. And we go to one of the best sources for the investigation of the warrior. And that, my friends, is Shakespeare. We go to the master author Shakespeare to help us learn about the quality of the mind and the voice of a warrior. To set the stage for you, our scene opens much like the scene with King Leonidas. I like that sentence so much. It gives me comfort. Because what it does for the warrior is it helps the warrior understand the journey that we’re on. The path that we’ve decided to pursue is no easy task. It’s no easy task. Remember, in both of these critical stories for the warrior, King Leonidas and King Henry V, how do both scenes open? Before we have the testimony of the great king, we have the spoken words of a trusted courier. A most trusted scout. And those words, those reports are fearful. Those reports are essentially feeding the dog of fear. That is very common. We witness that time and time again. And that is what it means to be a warrior is independent of the reports about us. Independent of the reports around us. Independent of the conditions or circumstances we find ourselves in, we take on the quality of King Leonidas. We take on the quality of King Henry V. We speak words of positive expectancy. We speak words of optimism. We speak words of hope. We speak words of love. That is the way of the warrior. Christ took what little they had and gave thanks. Then a miracle was performed. From a few loaves of bread and a few fish, Christ fed over 5,000 people. Now we look to this story because this story really summarizes and helps us understand this critical element of not only speaking positively but of being grateful for what we have. It is our gratitude for what we have in any given moment in our life that ultimately defines our destiny. My friends, here is the key I want you to remember: in any given moment of our life, we always have the temple of our mind. We always have the free will over how we will speak. And therefore how we will think. Independent of our circumstances, my friends, we can remain optimistic. Independent of the conditions of our life, we can speak words of hope. We can speak words of love. And my friends, we have to remember, it’s all or nothing. We are either feeding the dog of courage or the we are feeding the dog of fear. The results we enjoy in our life or the results that we dread in our life are determined by the quality of our thinking. In the Bible it says, “A house divided cannot stand.” That simply means you cannot simultaneously be feeding the dog of courage and the dog of fear. You cannot simultaneously be speaking positively and negatively. Because that house will not stand. In the Bible, very often, the word “House” is a metaphor for the temple of our mind. Your mind cannot stand strongly on the Word of God, if you are speaking the Word of God and simultaneously speaking the word of fear. Speaking the word of negativity. We have to be all in. We have to commit ourselves wholeheartedly to the warrior spirit. Which means we have to wholeheartedly commit ourselves to speaking the words of a warrior. Which means we have to wholeheartedly discipline ourselves to think like a warrior. And what I always tell those people is, “The first thing I want you to do is rejoice and be glad.” Rejoice and be glad. Here’s the reason why: When you witness the quality of your thinking and in that moment of witness identify the fact that you are not in alignment with your true nature, which is the presence of God in you. That my friends, is a moment to rejoice. Because before the identification of witness took place, you were simply identified only with the negative thinking. The mere fact that you are able to pull back on the negative thought and witness the thought means there must have been a gap between the thought and your witnessing. And my friends, in that gap lies your free will. In that gap lies the piece of God. In that gap lies the opportunity to re-calibrate the mind. To refocus your eyes. Both physical and eyes of your heart onto the positive mental attitude. Onto the Word of God. In fact, this concept comes right from the teaching of Christ. Christ says, “Blessed are they which are persecuted for righteousness’ sake. For theirs is the Kingdom of Heaven.” What’s so amazing about that is that Christ says, “Blessed are they which are persecuted for righteousness’ sake” he’s saying that after he gives his followers the assurance that “Blessed are the peacemakers for they will be called sons of God. Blessed are those that do hunger and thirst for righteousness. For they shall be filled.” So he’s offering us all these promises when we begin to identify with righteousness. And in the Bible, righteousness simply means “right thinking” about all departments in our life. Christ first gives us the assurance that when you are seeking righteousness, you will be fulfilled. But then it seems like he contradicts himself and says, “But blessed are you still when you are persecuted for righteousness’ sake. For yours is the Kingdom of Heaven.” Yet what we have to understand is that when we identify the fact that we are being persecuted, where does that persecution begin? Christ is referring to not the external conditions of our life but our own thinking. Our own thought process. Therefore, when we identify that we are persecuting ourselves. In other words, when we identify that we are feeding the dog of fear. When we identify that we are entertaining negative self-talk, rejoice! Rejoice and be glad for yours is the Kingdom of Heaven in that moment. For you’ve identified the fact that your mind is no longer set on the Word of God. And in that moment of identification, we can refocus. We can re-calibrate. The analogy I used for years with great success when I was teaching The CrossFit Goal-setting Course was the analogy of the physical application of our training. Imagine, for example that you are a coach of an athlete. You’re watching this athlete perform a pull-up. As you observe the athlete perform the pull-up, you identify the fact that the athlete has performed a repetition yet their chin did not go over the bar. How would you rate or judge or assess the quality of that repetition? Well, in my gym, it’s simply a matter of identifying the fact the range of motion or the alignment of the technique was not sufficiently met. The next thing we do is we immediately perform another repetition ensuring that that next step is in alignment. Is performed correctly. Now, to take this analogy one step further, imagine now that you, as the coach, are removed. Now, rather than observing the athlete, you are the athlete. You’re performing a pull-up. You identify the fact that on the prior repetition, your chin did not go over the bar. Do you, my friends, count that repetition? Or do you simply replace that rep, which did not count for it was not in alignment, with another repetition that is in alignment. That performed to the standard. That is performed through the entire range of motion. Well, you know the answer, my friends and so do I. We waste no time fussing on the repetition that clearly did not count and we spend more time focusing on the next rep. We spend more time ensuring that repetition will count. Well, you can see the beauty of that analogy to the temple of our mind. When we identify the fact that we have performed a mental repetition, which is not in alignment with our true nature. With our highest self. With God in us. We simply replace the thought process that did not count. Remember what Christ said, “We resist not evil with evil.” We do not waste time wrestling with the fact that we’re speaking to ourselves negatively. No, we go right to the source of our power, which is our tongue. Which is our mind. And we speak words of optimism. We speak words of hope. We speak words of love. We speak words of righteousness. This is where The Law of Repetition can really become extraordinarily powerful in our life. When we repeat over and over and over in the temple of our mind the right word structure. The right affirmations. The right mantras. When we speak the Word of God over and over and over within the temple of our mind, it is much more likely that that becomes the background music in our mind. For example, an athlete performs over and over and over again the desired outcome of the physical application of any technique they’re performing. Whether that be a martial artist, a swimmer, a surfer or a CrossFit athlete. That athlete spends time in practice performing the desired range of motion. The desired physical application of the technique. And sooner or later, that athlete achieves what we refer to as muscle memory. Well, my friends, remember everything we understand in the physical realm can be applied in the mental realm. Through repetition, we can achieve a set mind on positivity. Through repetition, we can essentially set our mind on the Word of God. We can set our mind on the warrior spirit. We can set our mind on the dog of courage. In order to do that, let me share with you some of my favorite mantras and affirmations. The first I will share is a particular affirmation that I have made for two very dear friends of mine that really embody and, I feel, exemplify the warrior spirit. One of these gentlemen is none other than Gray Maynard. One of the greatest UFC fighters I think the world has ever seen. A phenomenal mix-martial artist and a world-class wrestler. A world-class man. A great husband. A great father to his daughter. Just an amazing man. I created this affirmation for Gray because when Gray and I were training together doing his conditioning for his fights, we realized like all great athletes sooner or later understand, everything begins in the mind. And when we can condition our mind in the positive tense. Every other condition of our life will follow suit. The affirmation is this: “I believe in myself. And I love myself. And I constantly reaffirm my ability to succeed.” Oh, it’s so powerful. I’ll say it one more time. “I believe in myself. And I love myself. And I constantly reaffirm my ability to succeed.” That is a powerful affirmation. That affirmation, when repeated in the temple of our mind with significantly influence, in a very positive manner, the quality of our life. The other gentleman whom I utilized that mantra and affirmation for is another world-class mix-martial artist and jiu-jitsu fighter. His name is Nathan Mendelsohn. One of the best jiu-jitsu fighters in the world. A black belt under a dear friend of mine, Claudio Franca. That same affirmation has served Nathan Mendelsohn extraordinarily well. As many other dear friends of mine have laid testimony too. That affirmation is powerful. Another solid affirmation I love to utilize is “For greater is my God who is in me than he that is in the world.” That really enforces in the warrior spirit the fact that God is in us. God is strengthening us. God is residing over our mind. When we turn to his presence, anything and everything is possible. Well, my friends, I want to sincerely thank you for joining me today. And I’d like to repeat the prayer from my dear friend, Rolf Gates for you again on today’s episode. Because some of the feedback that we got from our previous episode was so powerful. People really resonated with this prayer. So let’s utilize this prayer again. And what we’ll see with this particular prayer is this prayer is the prayer of a warrior. For this prayer is reinforcing the quality of our mind. My friends, I pray that you would be safe, may you be happy, may you be healthy. May you discover your freedom. May you find enduring peace. And may you walk through the world with ease. My friends, may God bless you and keep you safe and I will speak to you very soon, back here on our next episode together on The Greg Amundson Show. Take care!